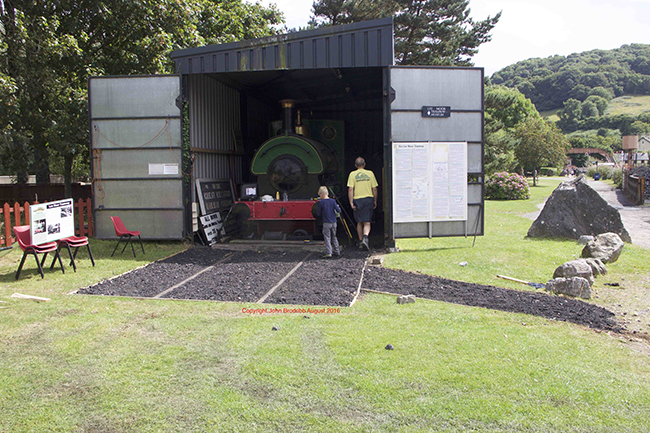 Over at the Lee Moor museum – that grey shed beyond the running shed and next to the Miniature Railway depot – work has now been completed on fettling the track and general area outside the museum. The proposed Buckfastleigh New Yard will not impinge on it significantly, and it will greatly improve conditions underfoot for future visitors. The “ballast” was dug out – actually the weeds were mostly raked off, as they had died during the dry weather – and retaining boards used to define the area. A path was also cut in from the existing roadway, with everything then given a liberal covering of clean ash from the running shed. Very many thanks to Declan Gregory, Alan Turner and Chris Armstrong for their help. 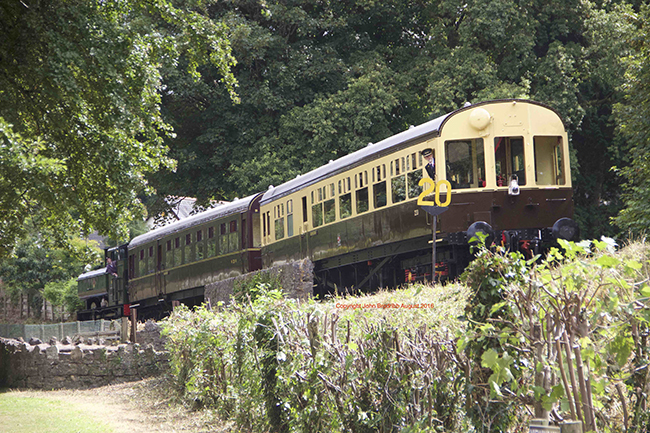 Locomotive 6412 was used with auto coaches W228 and 233 for a wedding charter on Saturday 04 August. Guests gathered at Buckfastleigh and were then taken by the Routemaster ’bus to Staverton church. After the ceremony the wedding party and guests made their way down to Nappers Crossing where the special train collected them for the return journey to Buckfastleigh. On the return they paused at Staverton station for refreshments and photographs. On arrival back at Buckfastleigh the guests and wedding party used the Routemaster ’bus to get to the reception venue in Buckfastleigh. All this was fitted around the standard blue two–train service; a fine piece of planning and operating by the SDR. Two locomotives have been on holiday. 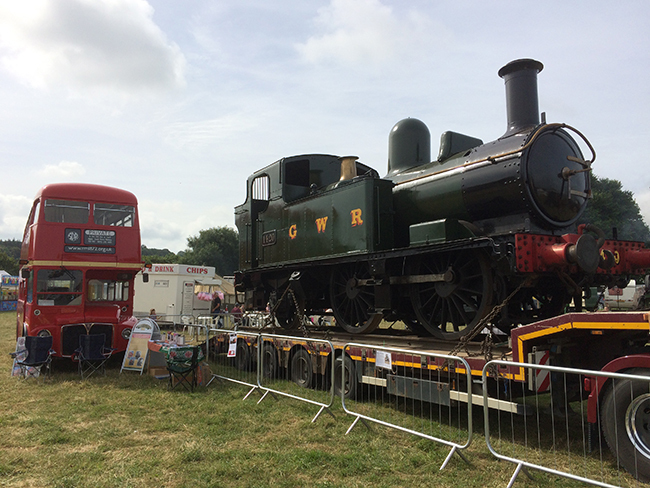 1420 had a weekend away at Churston, where it impersonated the Brixham Whippet at the Torbay Steam Fair. It certainly looks splendid at the moment, but appearances can be deceptive – there isn’t a boiler or firebox under the cladding! They have already been removed to allow its long-awaited overhaul to start. 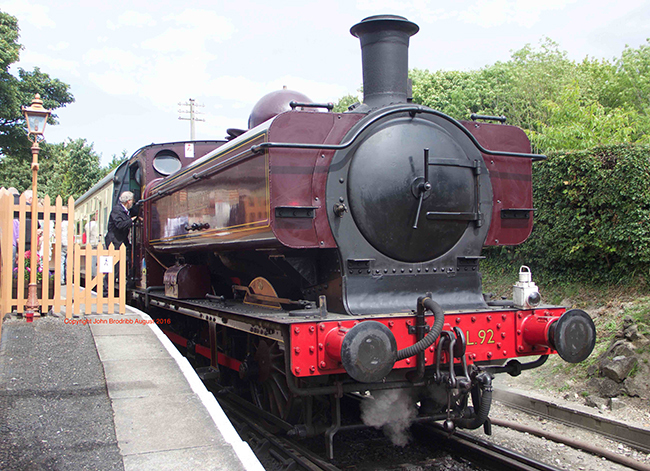 L92 is spending the season at the Chinnor & Princes Risborough Railway, where it is operating all of their steam services this season. L92’s first visit to Risborough was on 10th July on a training run ad only regular volunteers were allowed on board. The first passenger run was on July 24th and was only for people who had bought tickets for the first train several years ago. And finally; the BBC2 series “Full Steam Ahead” on Thursdays at 20.00 ( or iPlayer ) has sequences shot on the South Devon Railway. 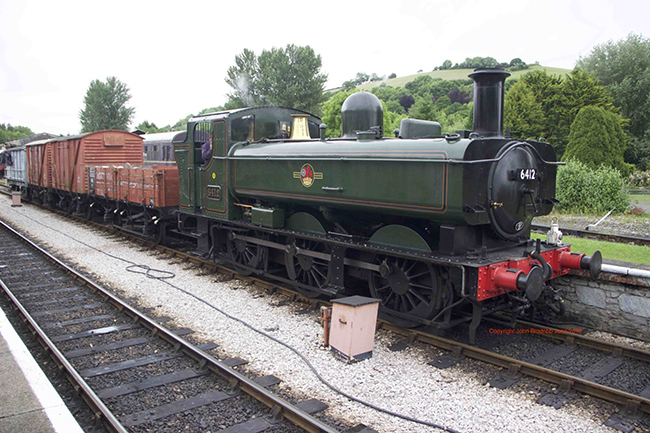 Episode 4 ( first broadcast 11th August 2016 ) featured retyring wheels at the South Devon Railway and the SDR also features in episode 5.